Pirates pitcher Francisco Liriano is Friday's Player of the Day and rises to fifth place in Box-Toppers player rankings for the season. Liriano pitched eight shutout innings and gave up only two hits in the 5-0 win over the Cardinals. Liriano earns 2.0 Box-Toppers points for being Player of the Day, giving him 16.7 for the season. He rises to fifth place in Box-Toppers player rankings (see the updated top 10 list on the home page). This is Liriano's career high Box-Toppers point total for a season. His previous high was 15.7 in 2010 with the Minnesota Twins. Blue Jays pitcher Mark Buehrle is American League Player of the Day. Buehrle pitched seven scoreless innings in the 3-2 win over the Royals. Todd Helton of the Rockies is National League Batter of the Day. Helton hit two home runs and drove in six runs in the 9-6 win over the Reds. This is the first time in more than two years that Helton has earned Player of the Game honors—his last time was Aug. 8, 2011. Helton has 116.4 career Box-Toppers points, ranked 32nd among all players since 1995, when Box-Toppers record-keeping began. Dustin Ackley of the Mariners is AL Batter of the Day. Ackley went 4-for-5 and drove in four runs in the 7-1 win over the Astros. Teheran (6.1IP 1R 8K W in 2-1 win vs. Marlins) earns 1.0 Box-Toppers point, giving him 11.7 for the season. Cano (2-3 2RBI 2R in 8-5 win vs. Orioles) earns 1.0 Box-Toppers point, giving him 10.5 for the season. Cano is the sixth batter this season with 10.0 or more Box-Toppers points. 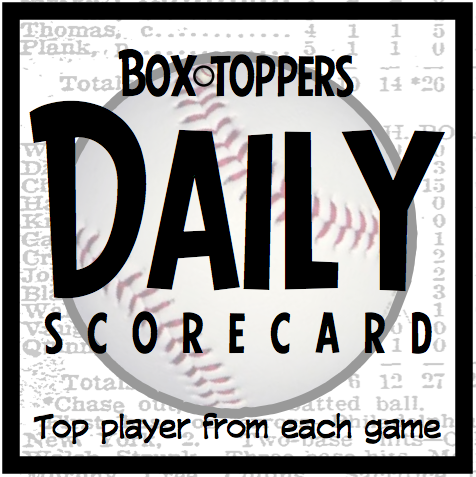 Liriano receives 2.0 Box-Toppers points for being Player of the Day. Buehrle receives 1.7 for AL Player of the Day. Helton and Ackley each receive 1.5 for being top Batter of the Day in their league. All of Friday's other Players of the Game (listed in the chart below) receive 1.0 Box-Toppers point.